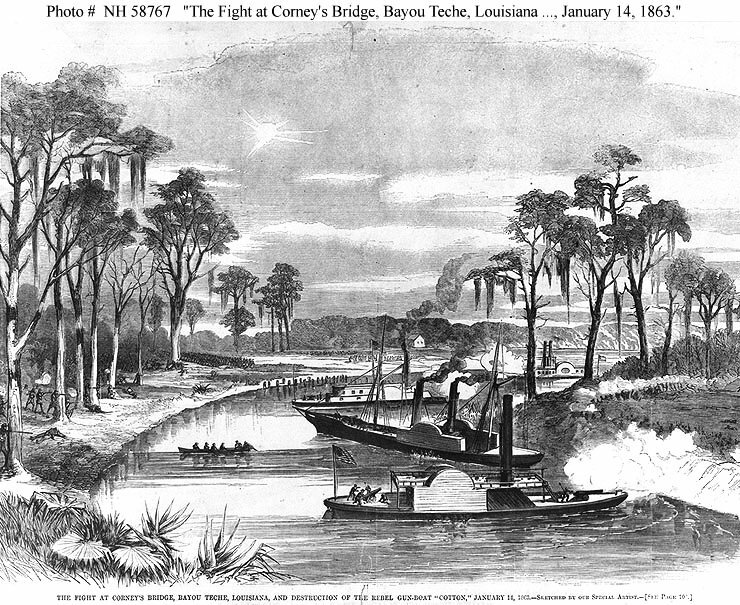 183k "The Fight at Corney's Bridge, Bayou Teche, Louisiana, and Destruction of the Rebel Gun-boat 'Cotton,', January 14, 1863." A line engraving published in "Harper's Weekly", 1863, showing the Confederate gunboat CSS J. A. Cotton engaging Federal gunboats, as Confederate troops fire from the shore. U.S. Navy ships in this engagement were USS Kinsman, USS Estrella, USS Diana and USS Calhoun. 155k "Engagement at Butte la Rose"
Line engraving after a sketch by H. Holtz, published in "Harper's Weekly", 1863, depicting the U.S. Navy gunboats USS Estrella, USS Calhoun, USS Arizona and USS Clifton (listed clockwise from lower right) engaging the Confederate gunboat CSS J.A. Cotton off Butte a la Rose, Louisiana, on 20 April 1863. Confederate Fort Burton (shown at left) was captured on the same day. 186k "Destruction of the 'Queen of the West' by Union Gun-Boats." Line engraving published in "Harper's Weekly", 1863, depicting CSS Queen of the West being destroyed in Grand Lake, Louisiana, during an attack by USS Estrella (extreme left), USS Calhoun (extreme right) and USS Arizona (second from right), 14 April 1863. 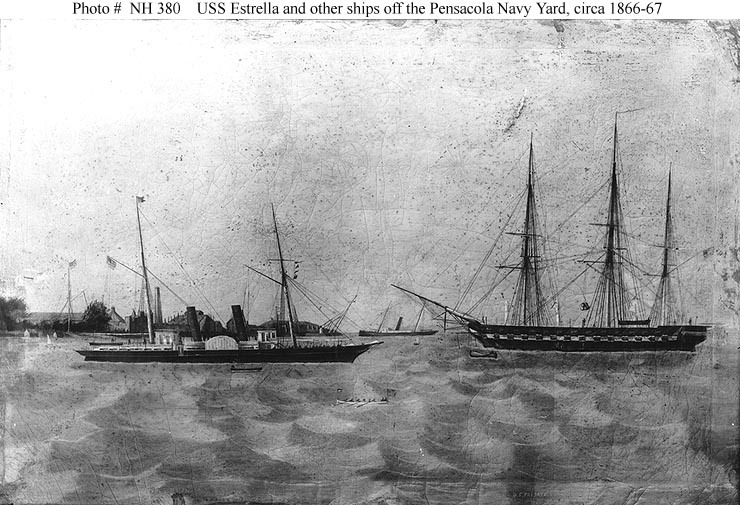 110k Painting depicting USS Estrella (at left) off the Pensacola Navy Yard, Florida, circa 1866-1867. USS Yucca is in the middle distance. The sailing frigate at right is not identified.